I have spent the past two weeks lamenting. You see, there is a rare gull in upstate New York. A juvenile Ross' Gull was found on Tupper Lake hanging around the ice fisherman waiting to feast on fish guts. This is a gull that is usually found in extreme arctic. People travel to the arctic and still don't see the bird. And here is one only 7 hours north. 7 hours seems easy until you can't find anyone to drive up there with you. The gull hung around for about a week and then couldn't be found. Needless to say, I didn't go to see the gull and I'm still regretting it. Flash forward a few days. 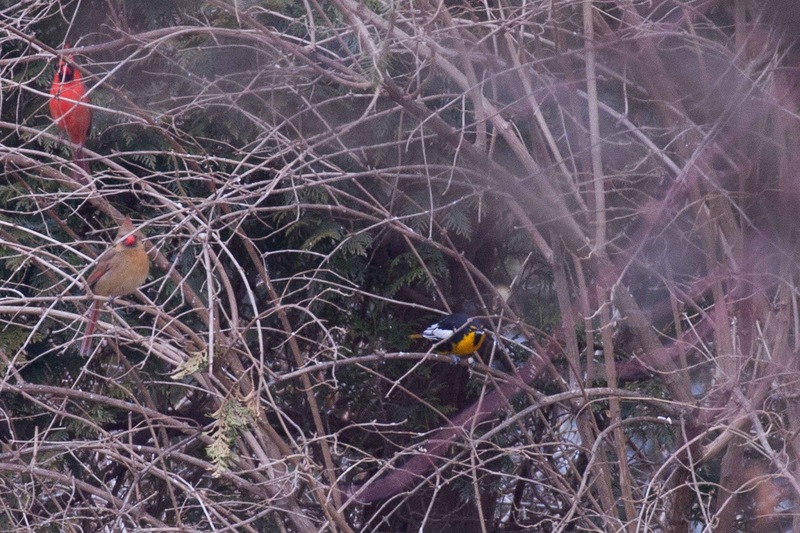 The Internet lit up on Friday with news of a Mega Rare bird being seen at bird feeders near Reading PA. Black-backed Orioles are only found in the mountains of Mexico which is nowhere close to Pennsylvania. This bird doesn't migrate. How did it get here? Who cares. I wasn't about to miss out on this one only an hour and a half away. Lori went with me. We arrived to masses of birders lining the sidewalk in this residential neighborhood. It was like a carnival atmosphere. The bird was easily seen but not close to the road. You can see it here hanging out with 2 Cardinals. This bird is so famous that the neighbors have a guest book for people to sign. We met people from New Jersey, Maryland and West Virginia. People are coming from all over to see the first recorded Black-backed Oriole in the United States. By the end of the day, 197 people saw AND recorded their visit in eBird. The jury is still out as to whether the bird will be "countable" in official records. In order to be legitimate, the records committee must be sure about the species - no doubt about that, and the provenance of the bird - big doubt about that. How did the bird get to Pennsylvania from Mexico? If the committee suspects that the bird got here by human hands - smuggled, accidentally transported by boat, plane or truck, or escaped from a cage - then the bird will not count as a wild bird and therefore will not be accepted on anyone's life list. So why then would 200+ birders go to see the bird? 2 reasons. 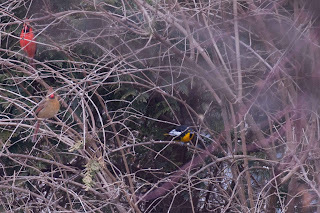 First, it's a pretty, orange bird in the middle of a gray winter. Second and more important, we all have the bird "in the bank" just in case the record committee accepts the bird as a wild vagrant. Check! Only time will tell.